Reef sharks are the most abundant shark species in the Caribbean, although their numbers have declined severely over the past decades. 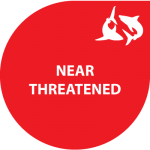 The status of its populations is currently assessed as near threatened, but experts say it is expected that the species will meet the criteria for a vulnerable classification soon. The Caribbean reef shark is a stereotypical looking reef dwelling shark. It occurs all throughout the Western Atlantic Ocean from the Southern United States down to Brazil. It is a tropical species that usually resides on the continental and insular shelves, staying close to the outer edges of the reefs. Its look is streamlined, with a sharp nose and slight yellowish and brown coloration on its side and back. 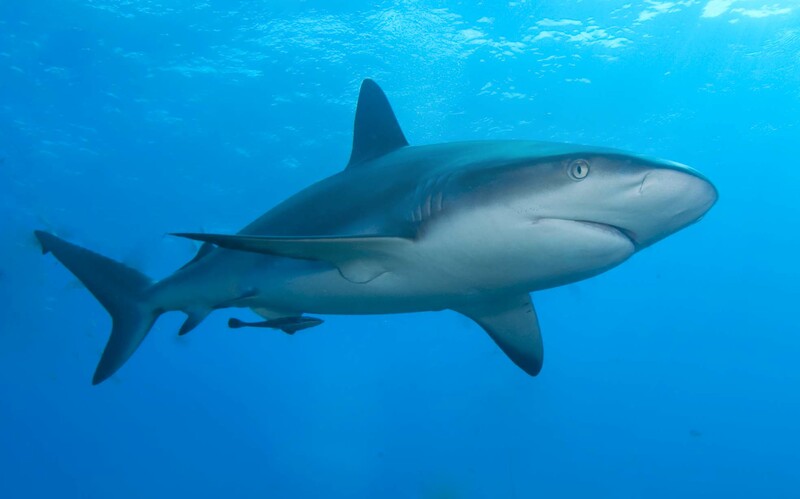 In spite of its reputation as a sleeping shark, the relatively large reef shark, that grows to up to ten feet (three meters) in length, is a top predator in the Caribbean reef ecosystem. Only juveniles are sometimes preyed upon by larger fishes, for instance by tiger sharks. The wealth of the reef provides the reef shark with ample food, such as bony fish, invertebrates, and sometimes even rays, such as stingrays or eagle rays. On the reefs around our islands, reefs sharks are usually sighted during scuba diving, after being attracted by the bubbles of divers, but they always keep their distance. There is no need to fear the sharks, they are peaceful swimming sharks and not aggressive. As for the majority of shark species, the reef shark’s reproduction is very slow. They only start reproducing after they grow to over five feet and then reproduce once per two years. They have a gestation period of approximately one year and only get three to six young each time. At birth, the pups are about two feet in length. In the Caribbean, the abundance of the reef shark is under pressure from fisheries, both from targeted fisheries, as well as from significant bycatches. The shark is targeted for its liver oil, meat, and fins, which are primarily, but not exclusively, sold to the Asian market. And in addition, coral bleaching, disease, and physical impact on the reef, may threaten the sharks because they could lead to a loss of relevant habitat for the reef-dependent species.